- In some scenes you can see the wire attached to Nomad to make it appear to float. - Several speed records are broken in this episode. Nomad's weapons travel at warp 15 and the Enterprise travels at warp 10. - I operate a satirical Twitter account based on this episode. If you're interested, then follow Nomad on Twitter. - Nomad thinking Kirk is its creator because he's from Earth and his last name is the same as the creator's. - Nomad killing Scotty and wiping Uhura's memory. - McCoy: "He's dead, Jim." Count 3. - Spock: "That 'unit' is a woman." Nomad: "A mass of conflicting impulses." - Nomad enhancing the warp engines. - Kirk talking Nomad to death. This irritating episode is painful to watch and all too familiar. 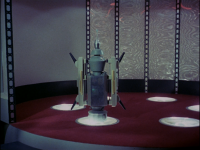 Once again Kirk talks a computer death, a feat made possible by the fact that, as I wrote in my review of Return of the Archons, "computers in the Star Trek universe have a tendency to be emotionally unstable and explode when they are sufficiently upset, contrary to how computers work in the real world." But that's not all, for there are any number of terrible aesthetic choices to pick on in this rather half-baked story. For starters, I find it hard to believe that the Enterprise could withstand even one blast, let alone four, equivalent to 90 photon torpedoes striking the ship at warp 15, or ~3375 times the speed of light. 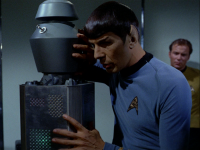 Then there's Spock's silly mind meld with Nomad. How was that supposed to even work exactly? 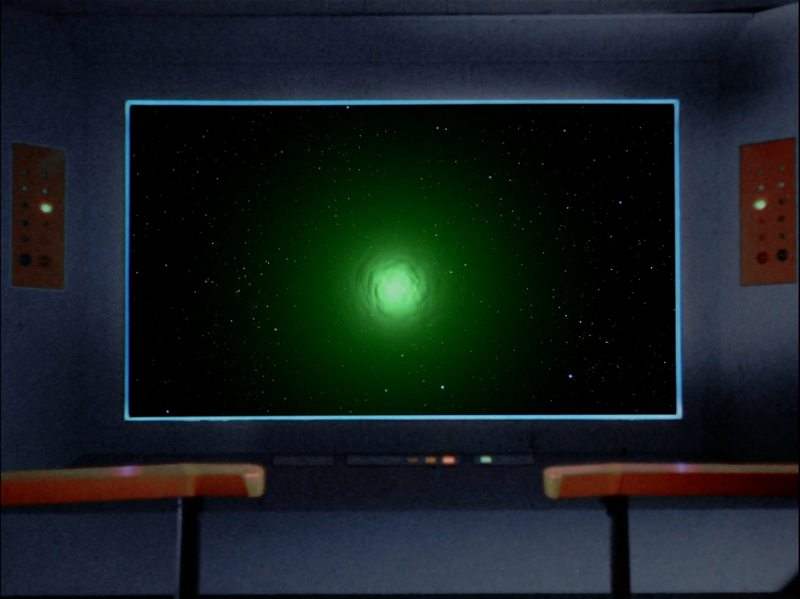 What's next, Spock mind melding with the ship's computer to make course corrections? All of this to the backdrop of listening to Nomad irrelevantly restate its name over and over again and utter prominent examples of eloquent phrasing such as, "Non sequitur. Your facts are uncoordinated." For a prop as awkward and unthreatening as Nomad was, it was nevertheless just filled to the brim with overwrought capabilities. 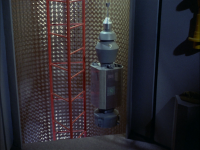 In addition to the excessive weaponry, it managed to kill Scotty and then bring him back to life, fly through forcefields, vaporize a number of security personnel, and wipe Uhura's memory. The plot point about Uhura losing all of her knowledge and needing to be "reeducated" is perhaps the most annoying part of the story. In a single day she goes from an elementary school level of knowledge back to college level. For us to swallow this fact, we have to assume that Nomad didn't really wipe her memory at all. Instead, it must have caused her to experience some kind of amnesia. 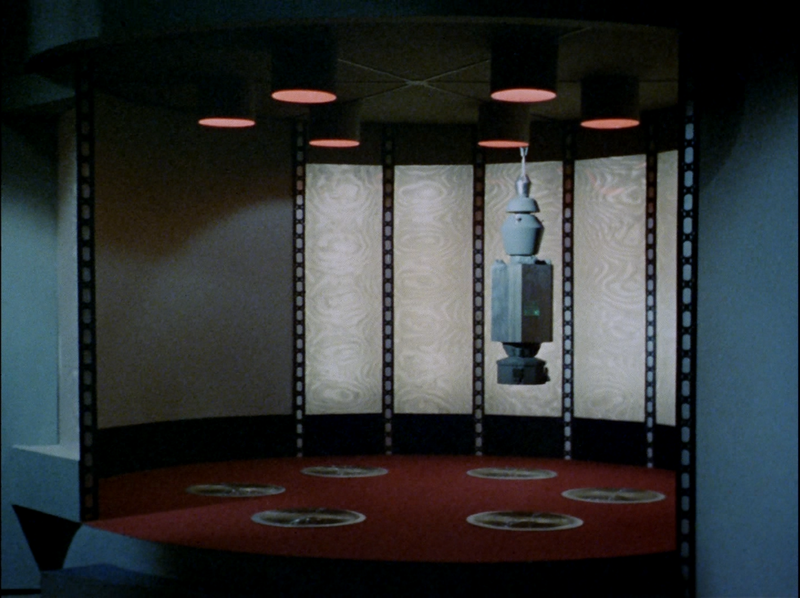 The knowledge must have still been there, but rendered difficult for Uhura to access. Or at least I hope this is the case because if it isn't then the whole thing becomes very difficult to explain very quickly. Not to mention the fact that the crew seems to have little regard for the possibility that Uhura may have forgotten everything about her personal life. 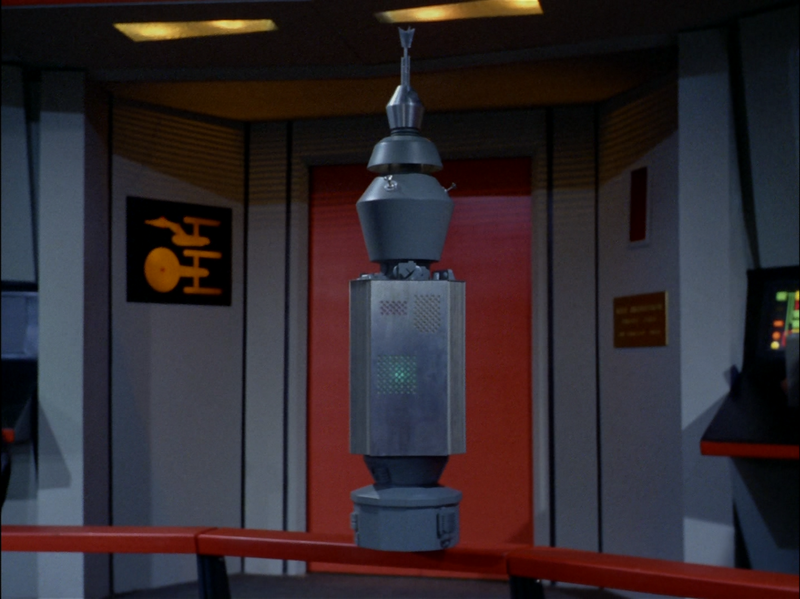 But poor aesthetics are nothing new on Star Trek. Perhaps the most unforgivable aspect of the story is the recklessness with which Kirk and Spock treat Nomad in the first place. 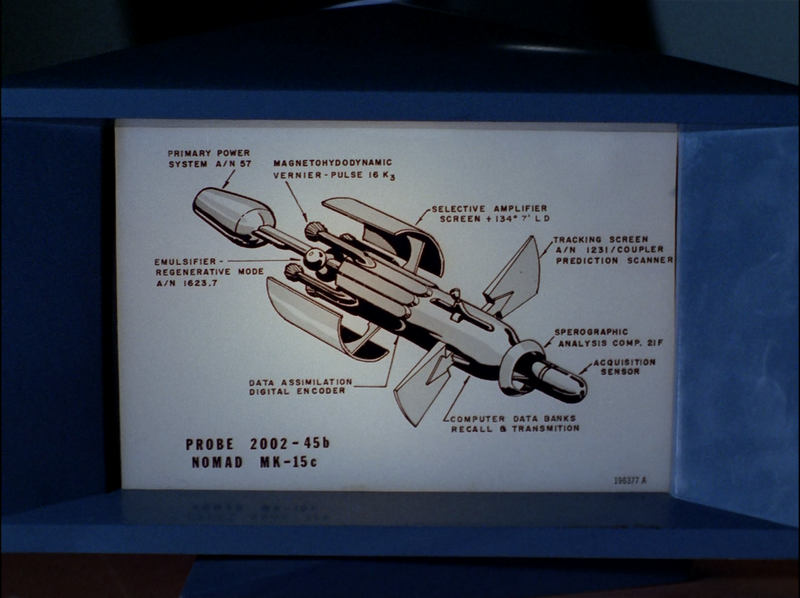 At the beginning of the story, Nomad starts firing extremely powerful weapons at the ship. 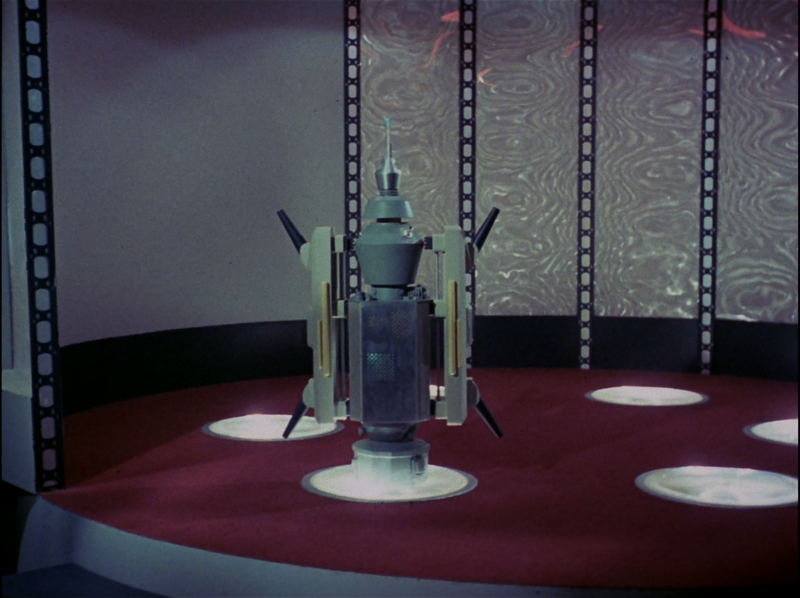 Kirk barely manages to convince it to stop and Nomad offers to visit the ship. From this moment forward, Nomad was vulnerable. 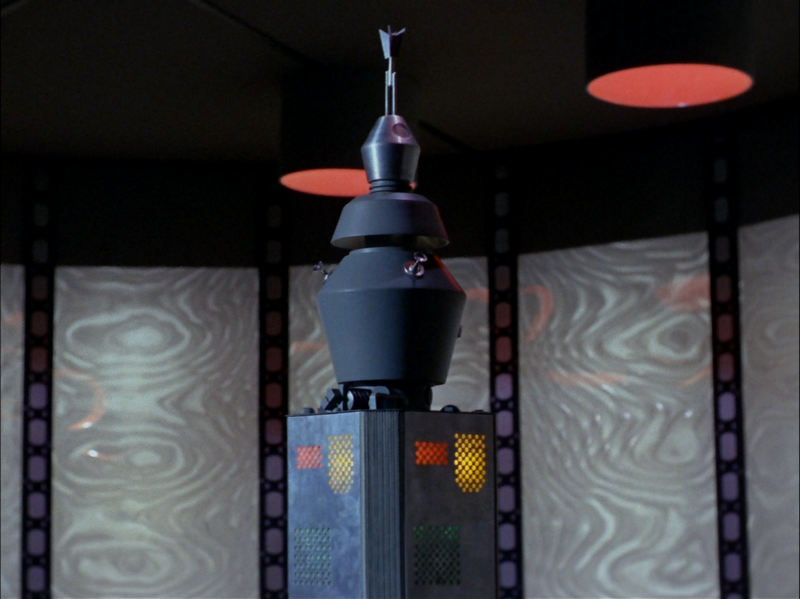 At any moment Kirk could have used the transporter to destroy Nomad, as I'm pretty sure a device capable of dematerializing something and then rematerializing it elsewhere is capable of permanently dematerializing something and never rematerializing it. 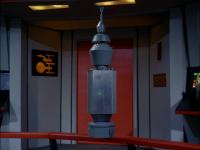 But we can rationalize that oversight quite simply by saying that Nomad's defense screens would not have permitted this, in spite of the fact that Kirk and Spock never tried. The issue of recklessness crosses into unforgivable territory shortly before the mind meld scene. Kirk explicitly convinced Nomad to lower its screens to allow Spock to mind meld with it. 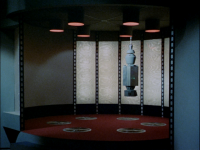 Why not phaser the damn thing out of existence as soon as it did so? Who cares where it came from and why it got this way? Kirk's and Spock's reckless scientific curiosity cost the lives of several crewmen and nearly the entire ship. All things considered despite the value and originality of a story about a space probe encountering something dangerously unexpected and its mission being corrupted beyond repair, the story's promising potential is drowned out by an onslaught of bad storytelling which is becoming all too common on Star Trek by this point. I like this episode because it has a traditional robot instead of an android. I also like the cold responses the robot gave: "Non-sequitur," "insufficient response," etc. 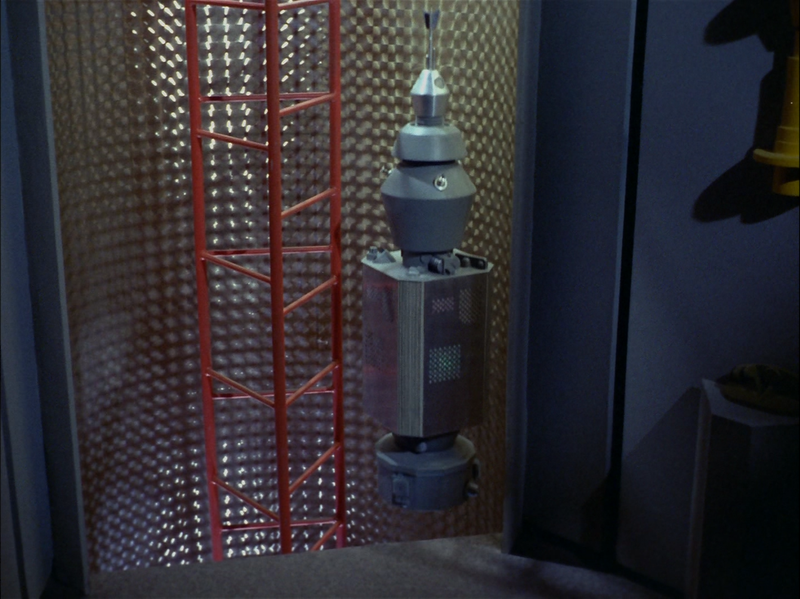 The biggest letdown while watching this episode is the whole "Uhura's brain got erased" subplot. How absurd is it to think that Nurse Chapel is going to reteach Uhura EVERYTHING, and she's going to do it just in time for the next episode. 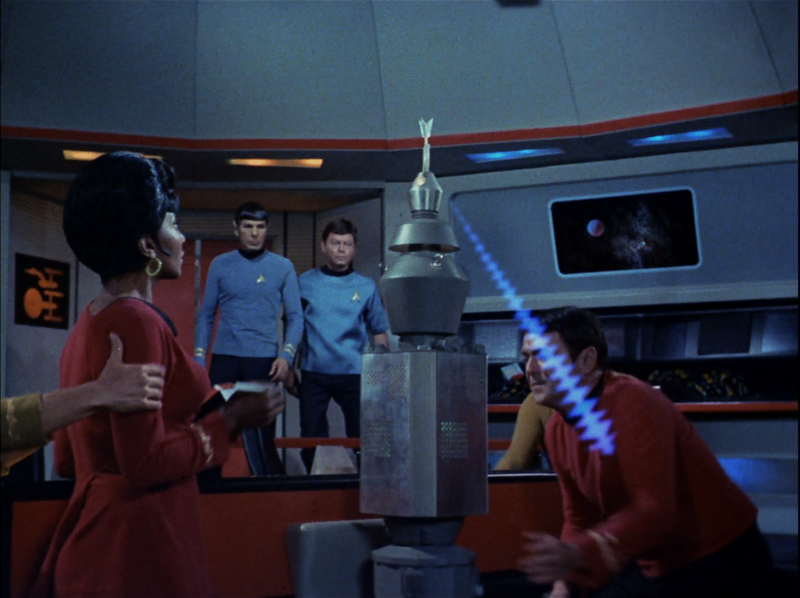 How is Uhura going to perform her duties on the bridge if she can't even pronounce the word "blue"? What a joke! Pimpdaddy is right (now there's a statement I never would have imagined myself making)! 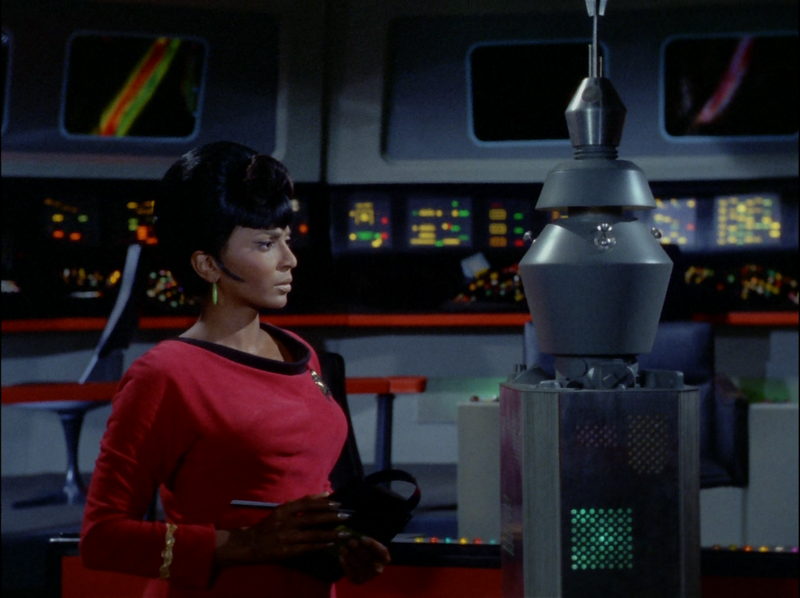 It's totally absurd to think Uhura will just be "re-educated" to be a fullly functional starfleet officer. But even if we can make peace with the idea that she'll somehow learn all the job-related functions (she's an astronaut, so she probably started out a with a pretty good brain, right? Stay with me, my fellow retconners)... but how is she supposed to resume her LIFE without any personal memories? What about her family, friends, memories of growing up, etc.? Somebody should look for instances in subsequent episodes where she refers to things she should not be able to recall. I thought this was a 7. In the 2nd tier of shows in the second season. Nomad and how its purpose changed is excellent. That main plot was great. Erasing the brain was cool, but the reeducation was unbelieveable even for star date 4,000. It seems clear on even the most cursory of inspections that Nomad started life as a patio heater. 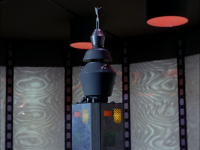 There are several of these 'units' in the garden of the pub near where I live and I tried to destroy them in the way that Kirk destroyed Nomad but they outwitted me by ignoring me completely. They did however have an off switch on the side. Pity about the sub-plot with Uhura which was pointless and had so many holes in it. 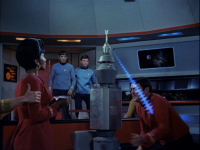 This episode does, however, invalidate a recent popular memegif: Scotty was *not* the only redshirt never to be killed. He just got resurrected when he did. 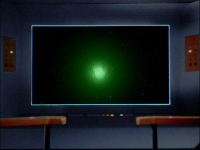 I would imagine, watching it at the time, if you'd noticed the redshirt tendency, his death might have had some impact for the original audience that it doesn't for the watchers today. The biggest problem with Uhura's memory wipe aside from everyone else's complaints was that she was fluent in Swahili. I'm kind of surprised that no one else mentioned this little bit of idiocy.